You must be wondering what is this unusual combination of bottle gourd and cauliflower? I usually prepare a bottle gourd – potato soup and for a change, I decided to use cauliflower instead of potato because I was trying to make a low-carb soup and have had success substituting mashed cauliflower for mashed potato in this low-carb vegan shepherd’s pie recipe. Mashed cauliflower is as creamy as mashed potatoes. You wouldn’t believe me until you try it for yourself. Both cauliflower and bottle gourd are good choices when you are on a low-carb diet. Note that they are pretty low in protein too, so try to pair it with a good source of protein. While reading about bottle gourd, I found some pretty amazing information. The mature gourd is dried and used as a bottle (hence the name), vessel and even to make tampura, sitar, and veena. Have you seen the kamandalams carried by sages in old movies? They have also dried bottle gourd. How cool is that? Did you know this before? Trying to shed some pounds? Then low-carb vegetables like bottle gourd and cauliflower should become your favorites. 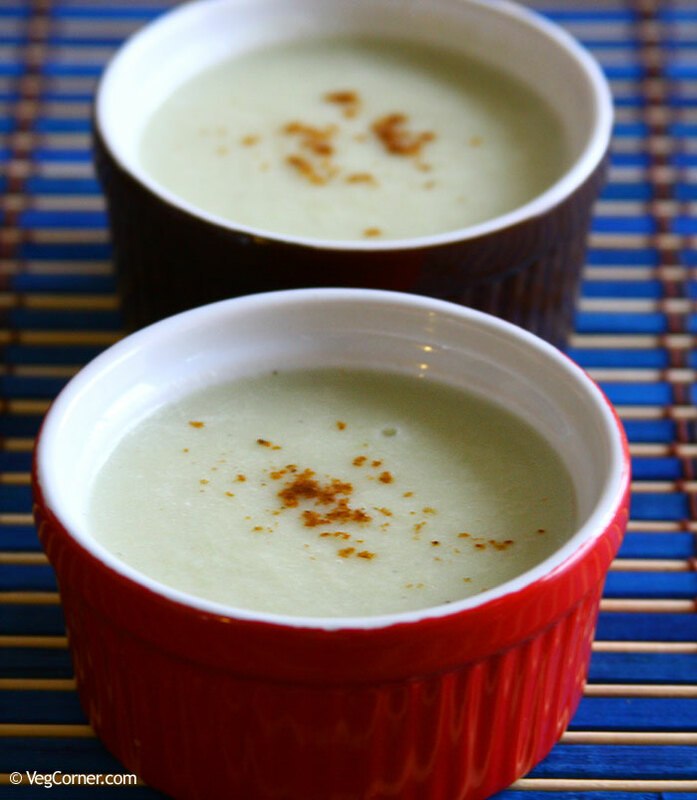 Try this soup and you will be amazed how creamy and filling a low calorie soup can be. Dry roast all the ingredients together in a frying pan and powder it. In a big sauce pan or pot, heat the butter until it melts. Add the chopped onions and a pinch of salt and fry for a couple of minutes until the onions are tender. Now add the ginger, grated bottle gourd, cauliflower, 4 cups of broth/water or just enough to cover the vegetables, salt and pepper (or spice powder). Stir it well together. Cook this on medium heat for about 20 minutes. 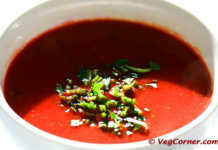 Remove the pot from the stove and puree it into a smooth, creamy mixture using an immersion blender. Add the milk and blend it well once again. Bring the pot back to the stove and let the soup simmer in low-medium heat for another 5 minutes. Add some more water if necessary and season it with salt and pepper to suit your tastes. Serve it warm. This cauliflower soup was rich and creamy. I think the soup would have been creamy even without the addition of milk because of the texture of mashed cauliflower. The soup also tends to be a little sweet, so do season it enough with pepper. I reserved some of the soup for my kids before adding some more pepper. Both of them loved this soup very much, especially my 15 month old. 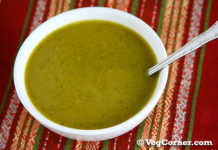 I especially like this soup with freshly prepared spiced powder instead of ground pepper. So do give it a try. I got the idea from the curried cauliflower soup I usually prepare. If you are not able to find bottle gourd, you can substitute zucchini, yellow squash, butternut squash, pumpkin or ash gourd in this recipe. Zucchini and yellow squash can be used without peeling. As mentioned earlier cauliflower can be replaced by potatoes as well. You can also add crushed garlic along with the ginger. For a vegan version, use olive oil instead of butter and any unsweetened non-dairy milk of your choice. For more of a coconutty flavor you could also try coconut oil and light coconut milk instead of butter and dairy milk. Madhuram, the protein in take varies based on the weight and age. My elder one is in his preteen and between 12-18 is the age for maximum growth and at least 1 gm per kg of body weight is required. I make sure morning breakfast is really protein rich because that will keep kids energetic through out the day. Also he works out in the morning and 2 scoops of whey protein contains 19g of protein which I think is good enough post work out. Soup looks yummy. You are right, just cauliflower alone gives a lot of creaminess to the soup. I make roasted cauliflower soup but never tried with another veggie. Healthy and yummy soup. Love the click. Thx for linking to the event. 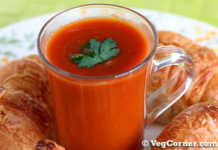 Wow wat an excellent combo Madhu,seriously soup looks wonderful and comforting..thanks for sending. This is one really healthy and heart warming soup..so unique and good. I am hosting this month’s veggie/fruit a month- bottlegourd event. Will really appreciate if you can send in this lovely entry.